After having major success with the Rock Di World single on tour with Sean Paul, Chi-Ching officially released the single with Sean Paul’s Dutty Rock Productions label — to which he is now signed. On Friday, March 30, Chi-Ching Ching (born Radion Beckford) released the official music video for the Rock Di World Remix featuring African acts Patoranking and Stonebwoy and American entertainer Fatman Scoop. The viral song garnered so much attention that Canadian video producer Kieran Khan took the lead on the music video. The remix encapsulates the unmatched energy and worldwide appeal of Dancehall as well as highlights the international synergies formed by Jamaican entertainer Chi-Ching Ching. “The storyline of the song, is that barriers and borders are no more. 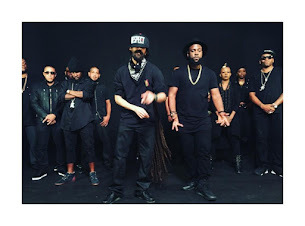 You have Afrobeat that’s now fusing with Dancehall, and then they incorporate dancing into it,” revealed Khan. Khan alluded that it was important for the video to showcase Chi-Ching Ching’s truth; that of a dancer turned internationally acclaimed performing and recording artiste. “Rock Di World is a powerful and inspirational song to make the whole word happy and just want to dance. The dance move is created by dancer friend Shakespeare, and it is so easy; no bathroom training required, no mirror needed,” the effervescent Chi-Ching Ching explained. Dubbed #ChingLinks, Chi-Ching Ching’s fans are already looking forward to the official release of the Rope music video, which has been teased as the second dance anthem to be released from his debut album that is in the final stages of production.